iPhone 4 Ringtone Maker can convert any time length of the video/audio to M4R iPhone 4 Ringtone, edit the added iPhone ringtone, along with the function to pre-listen the original sound or the converted file sound before you make the M4R iPhone Ringtone. 4Videosoft iPhone 4 Ringtone Maker, iPhone 4 M4R Ringtone Maker is available for iPhone 4 users to convert MP3 to iPhone 4, iPhone OS 3.0/3.1 Ringtone, even convert any video/audio to iPhone 4 M4R Ringtone, including 3GP, AVI, MKV, RM, MOV, XviD, M4A, MP3 to M4R iPhone 4 ringtone. Also convert MTV albums, concert recordings, and all popular DVDs to iPhone ringtone. Most pleasantly, you can put the converted M4R Ringtone on the iPhone 4 directly without iTunes. Furthermore, iPhone 4 Ringtone Maker can convert any time length of the video/audio to M4R iPhone 4 Ringtone, edit the added iPhone ringtone, along with the function to pre-listen the original sound or the converted file sound before you make the M4R iPhone Ringtone. What¡¯s more, the impressive and user-friendly interface would please you great more. 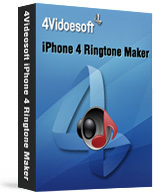 4Videosoft iPhone 4 Ringtone Maker is really easy to use. The whole process of generation can be finished in only two clicks. 4Videosoft iPhone 4 Ringtone Maker makes it practicable to convert 3GP, AVI, MKV, RM, MOV, XviD,MPEG, WMV, DivX, MP4, H.264/AVC, etc to iPhone M4R.